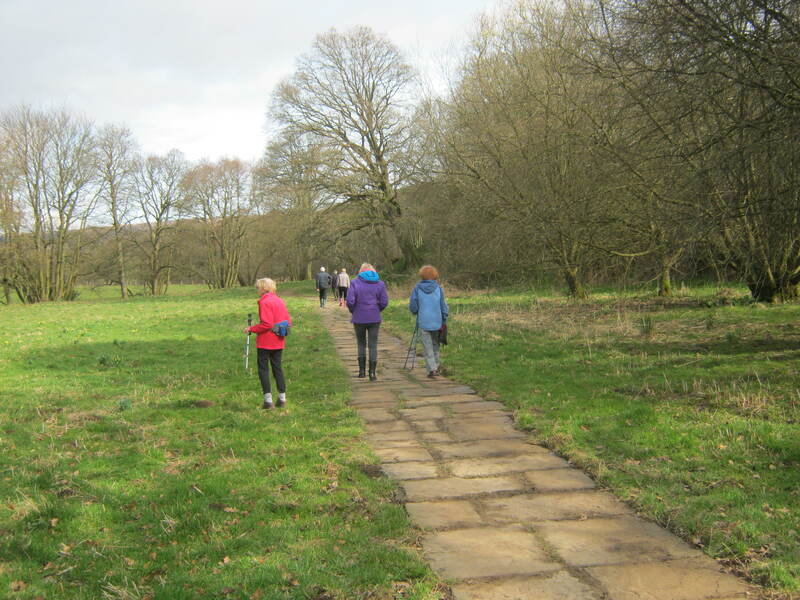 What a beautiful walk that must’ve been–the sunshine! I remember sunshine . . . sort of. The weather couldn’t be much uglier here–a combo of rain and snow and high winds–ick. Your hand work all looks amazing–the sweater is adorable. We have been very lucky with Winter this year, it was very mild, and Spring came early. We have sunshine again today, Sunday. ‘herding sheep in fog’! brilliant! Looks like you had a lovely walk – I don’t know about new batteries, I need a complete overhaul! Can’t seem to find my power pack, I think I must be solar powered and will perk up when the sun shines – hope so! Miss F’s jumper looks just perfect for a queen of the fairies and the unicorns. If I can muster up any energy, I will be gardening this weekend. If that is you on low energy levels I wonder what you are like fully charged? I have just been looking at your latest crochet which is beautiful. I’m back again, those daffodils keep calling me!! love the unicorn — so so cute! 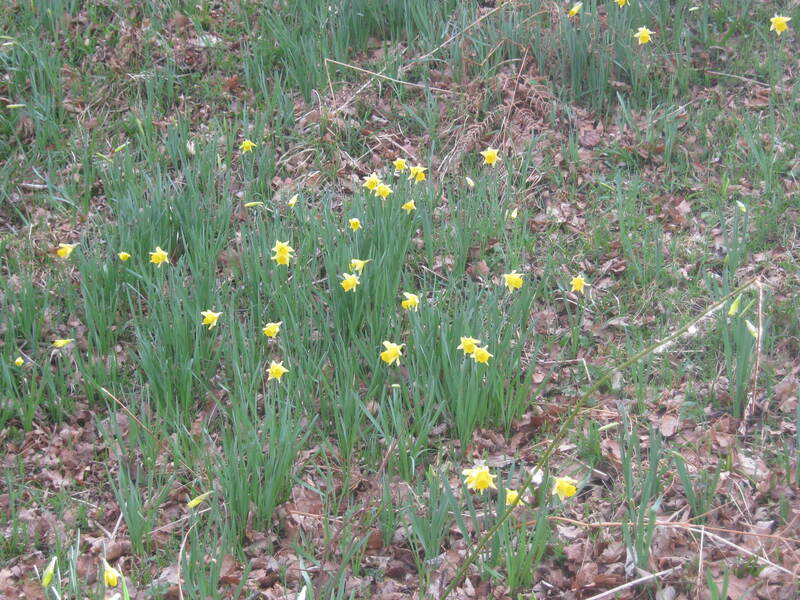 Oh, how I long for daffodils – and crocus, hyacinths, etc.! (We’re not quite there yet.) What a lovely walk! This weekend, I shall be conjuring a certain house gnome from the land of the Fae, and choosing a winner! The unicorn was made last year! I seem to have achieved very little this year in terms of finishes but I am pleased I am learning new things with the patchwork classes. I love our art work, it comes from the heart. Silly button, I wasn’t finished! I am going to take Granny Necchi out of her cabinet and take her to the shop for a motor cleaning, that will probably take me a whole day….handy I am not! I bet you are! All those dogs sound like real hard work. Hope you get lots of time for knitting and sewng. Miss F’s sweater is lovely and I do love the colors. And that Unicorn is adorable. Someone is going to love that thing to pieces. I am at the stage of retirement when I have to think every morning what day it is and sometimes Fridays catch me by surprise. Cute sweater! It looks very Springish with the beautiful pastel colors and the patterns are lovely. The unicorn is adorable. My plans for the weekend…getting the last bits that we can out of the basement in preparation for the contractor coming this week to remove the drywall and carpet. Hopefully venture out in some sunshine. This morning we awoke to a dusting of snow. Ugh And hopefully some stitching on a mermaid or some knitting. Enjoy your weekend! Snow? You don’t want snow! Hope the basement work progresses satisfactorily leaving you lots of time for mermaids and knitting. sweater and unicorn both turned out lovely! we’re enjoying the same kind of weather. Isn’t it gorgeous? Back to taking Gibbs out for his daily walks in the park, after my inactivity due to foot op, and the exercise is doing us all the world of good. So pleased you are fully back on your feet, it’s been a long slog for you and I bet Gibbs is loving an active Mum. Daffodils! Rhubarb! So jealous!! We are having a storm today, thankfully it is mostly rain, which will go a long way toward cleaning the snow. Then it needs to stay above freezing long enough to dry out a bit so no ice. Fingers crossed! 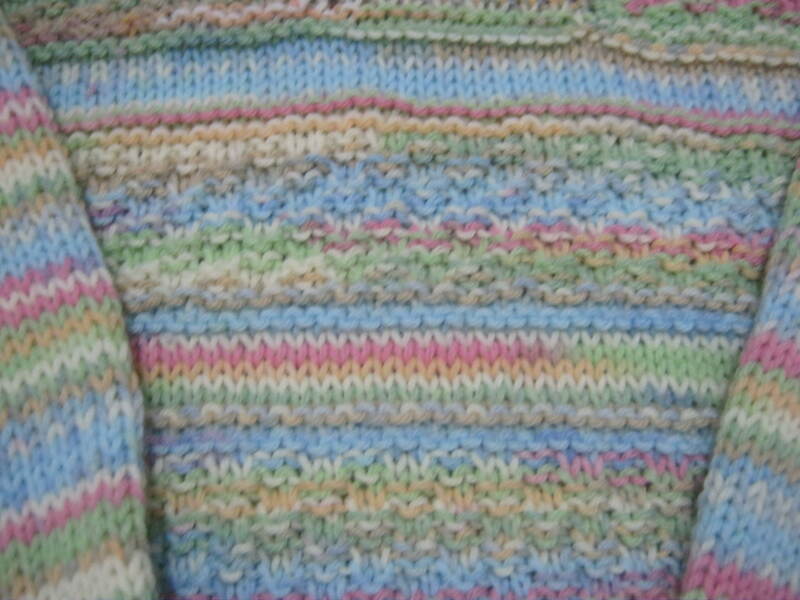 I am plodding away on my mom’s sweater, really want it done by next weekend when I see her next. Oh my I can’t believe what long cold winters you have and then those hot summers. We certainly are lucky with four seasons and less extreme temperatures. Hope the rain is heralding the start of your Spring. We do have long winters, but our summers are not so bad, we get a hot few days, but not usually weeks of heat like other parts of the country do. I can’t wait for a sunny and warm day! Kate you are a marvel- will not Angel Bill help some more? Enjoy your day, which I now realise is Saturday and we are only at Friday early afternoon. At the time you wrote, it was still (barely) Friday, and as I write, it’s the wee hours of Saturday. Time for some kip before I have to get cracking. As for Bill, he gets the weekend off after his Herculean labours, and quite right too. I’m glad you had lovely weather for your walk – the sun shines on the righteous! Perfect little girl’s jumper and the stitch looks simple enough to do without too much stress but interesting enough to keep you awake. I’m going to quilt my niece’s foxy quilt this weekend. I might not start today as one of my dogs woke me up in the early hours and I couldn’t get back to sleep so I’ve been up since around 4 a.m. and I don’t want to mess it up by quilting while knackered – a technical term you might not yet have come across. I am looking forward to seeing the foxy quilt again. I know that technical term, its linked to a few more, like b***s up, and botch and frog. So maybe have a little nap and threaten the offending dog with no walk. And I won’t fill in the Add Contact form by mistake if you do!! I am writing the pattern number down it looks like a jumper I could do and I like the fact the neck does not have an opening – but I expect it might not be so simple to get over the head if you happen to have a child with a larger one. I am not sure mine would look as nice as your though. 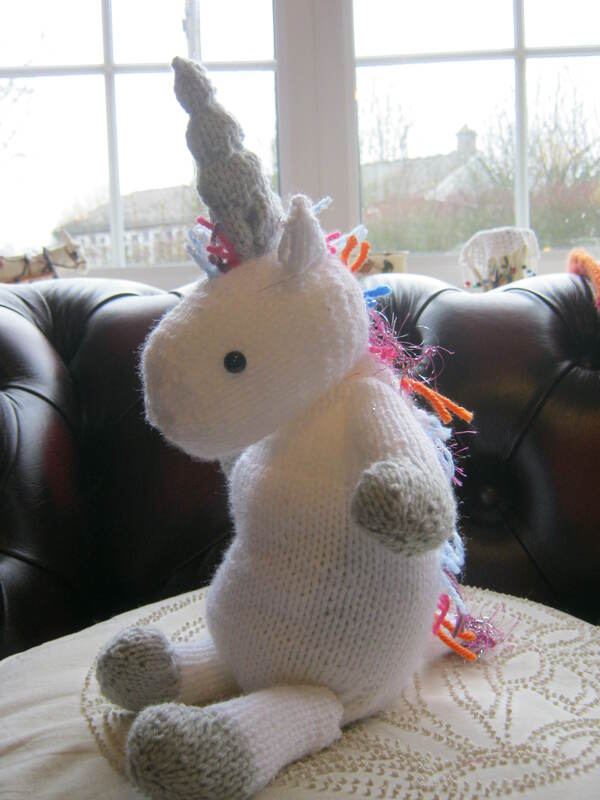 I would love to knit the Unicorn but I think that would be stretch too far for me at the moment with my limited skills and understanding of patterns – I sometimes feel I am reading morse code until the penny drops of what they are asking you to do! I would love to think I could change my batteries – I would go for the Duracell Long Life. Oh yes oh for some long life batteries! I know what you mean about patterns. I once made a toy dog from a kit- fur fabric. Well I gave up trying to “understand” the instructions and settled for just doing as I was told and it worked- one perfectly acceptable toy dog. I wonder what happened to it and who I was making it for? So glad you had sunshine for your walk. It was lovely here too on Wednesday, but when I mentioned this last night at the knitting group everyone was surprised because it had been dull and miserable 10 miles inland clearly I am living on the Costa del Ceredigion! Mind you, it’s cloudy again today. This weekend I might just finish the squares I am making for my latest blanket – I haven’t got around to posting about it, partly because I don’t think it looks very promising unconstructed, although I have high hopes for it once it’s stitched together (it uses a sort of optical illusion to give the final effect). Other than that, I think I might make a few more greeting cards from scraps so I have lots to show in next month’s scraphappy. It was a grey day here this morning and a bit breezy but the sun is breaking through now. Sunshine on a walk does lift the old spirits. I am looking forward to seeing your blanket it sounds marvellous with an optical illusion. Somethings do look unimpressive while you are making them. Apart from a few more rows on the crochet blanket haven’t done anything with my scraps- I am rather relying on the patchwork class and the scrappy border on my quilt for my next scrap happy post. Believe it or not I don’t have anything on the go at the moment. Will have to remedy that quick smart – won’t be long before winter will be knocking on our door and charities will ‘asking’ for more and more to hand out. My trick with necks on children’s jumpers is – if I’ve cast off loose enough for me to pull it over my adult head then it will be fine. I cast off in rib which gives a bit of a stretch but allows it to return to a neat and tidy cast off edge – if you can understand what I mean. I do understand your meaning. The pattern called for it to be cast off in rib so I did. I never knew that the reason was to give it more Give! 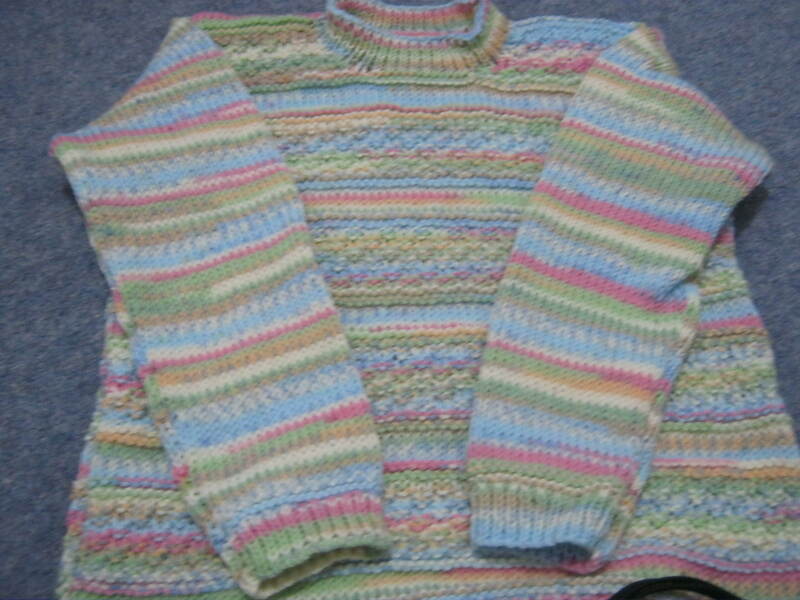 I like sirdar yarn a lot. It’s good quality and super soft for young skins. It is pretty and right now is the time to go.